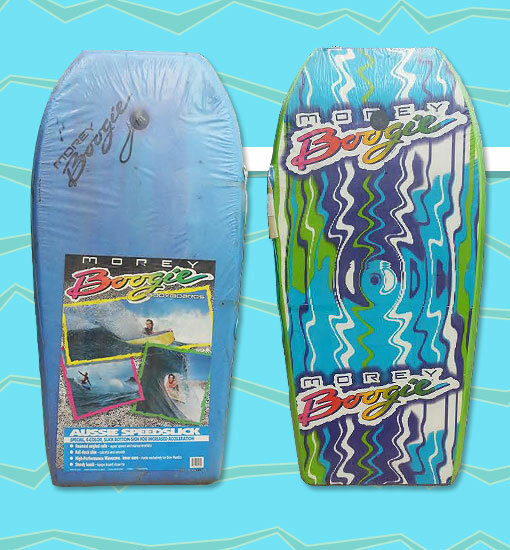 Morey Boogie's Aussie model was reborn in the early 1990s as the new Aussie Speedslick, featuring a slick bottom with colorful graphics. This was achieved through a patented process and a two-layer bottom skin -- an opaque inner layer and a transparent outer layer. The graphics were printed in reverse on the inner face of the transparent layer, and the two layers were then adhesively bonded together to seal the printed surface between the two layers of polyethylene. The result: vibrant, 4-color graphics that were durable and resisted scratching and wear. Photo: Paul Davis.